Austin – This is the fourth time we’ve reviewed The Antlers on the Panic Manual, so it’s quite possible to say we like them quite a bit. Friday night was a great source of frustration for me, as once again, I was foiled in my attempt to see She & Him. The lineup was extremely long and my attempt to casually walk through the side entrance pretending to be someone important ultimately failed. I then retreated to Esther’s Follie to check out some comedy acts to cheer me up. Once fully cheered, I decided I liked nothing more then to hear some familiar depressing music. It was my emotional roller coaster night I guess. Midnight seemed like a perfect time for the Antlers to play. It’s dark outside and they play dark music. They were playing the French Kiss showcase, which also featured bands like An Horse, Suckers and Les Savy Favs. Just like their opening set for the Editors in February, the Antlers played only a handful of songs – five to be exact, and just like that concert a month ago, I was equally captivated by their music. This time, I was slightly less captivated as the sound system pretty much sucked balls for some reason. Still, it’s always a pleasure to see Pete Silbermann sing. The man does not hit all his notes, and somehow every version of Two comes out sounding a bit different, but the intensity and heart behind the voice makes it all okay somehow. 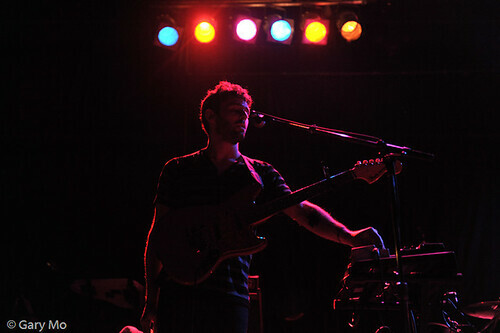 The Antlers have become experts at the building up songs. The music starts off quietly, maybe a few beeps, a few boops. Some slowly paced drum beats and stellar guitar feedback and then the next thing you know, Silbermann’s wailing on his guitar, the synth has become deafening and theres a massive wall of sound hitting you square in the face. It’s quite the treat experiencing it. This wasn’t the best set of theirs I’ve seen, I thought the some of the tenderness that is Bear was lost amongst the chattering and the crappy sound system. Still, a band I would recommend seeing live. ps. the picture was not from sxsw, but from February because our photographer Gary decided to take a break. Toronto – Here is an A to Z list of bands playing at SXSW. I’ve even been kind enough to link each band to their respective myspace/website so you can check them out*. Apologies if I missed any letters, English isn’t my first language. Broken Bells – Danger Mouse + The guy from the Shins? Yes please. Will this album only kind of change Natalie Portman’s life? Chew Lips – English dance-pop act has Josh blowing his load with each single they release. Might check them out. Everybody Was In The French Resistance…Now! – I had no idea Eddie Argos (of Art Brut) had a new band. It has to be great. In Argos I trust. Fanfarlo -They cancelled their show in Toronto in December. I now get to see this London band at a warmer venue. Awesome. Luna is an amazing track. Gay Witch Abortion – I have never heard of this band, but look at that band name. Imaad Wasif – 24 Terrorist character or Canadian born Indian singer songwriter? Check out his show and decide. Jj – Where did these Swedes come from? From Africa to Malaga was such a good chill tune, but their new album sounds more or less the same. Kyle Lee – Is this a Chinese Texan hip hop artist? I don’t know, but he has an Asian last name so here’s hoping. Local Natives – They impressed many people last year, a breakout album later, these guys are ready to rule Earth. Marina and the Diamonds – I wrote about them already, but she’ll be very good live. Neon Indian – Hipster ratio will be off the charts for this HRO fan favorite. Pains of Being Pure at Heart – Shoegazey throwback band played about a billion shows last year, I didn’t catch them then. I won’t make the same mistake again. Maybe. Quest for Fire – No idea who they are but they are the first band with the letter Q in it I see. Clever marketing yo. Russian Futurists – Had a blast seeing them at Wavelengths despite short set. Should have equal blast at SXSW despite short set. Spoon – Austin’s favourite band open SXSW at Stubbs with what undoubtedly will be a great performance. Toro Y Moi – One of the first big discoveries of 2010, this dude will bring some chilled tunes to Austin. Ume – Frank from Chromewaves really enjoys this bands live set. Who am I to argue. VV Brown – Wonderfully talented retro pop sounding VV Brown will bring what is surely a great set to SXSW. Zeus - Arts and Craft band is about to hit the stratusphere with their debut (?) album.